San Franciscans don’t drive nearly as much as previously thought, according to new SFMTA survey data. But the needle hasn’t moved much in recent years either. More than 50 percent of trips in San Francisco are made without a private automobile — and it’s been that way for at least three years, according to travel survey results presented at an SFMTA Board meeting today [PDF, page 18]. Last year, 52 percent of trips in the city were made by transit, walking, biking, car-share, taxi, or ride hailing services like Lyft and Uber. Solo driving accounted for only 27 percent of trips in 2014, the SFMTA found, with carpooling accounting for another 21 percent. Those two types of trips are what the agency counts as “private auto” trips. The findings are a significant departure from previously released data on city travel patterns, which had estimated that 62 percent of trips in the city are made with private autos. But those numbers were based on a less accurate survey methodology, SFMTA Sustainable Streets Director Tom Maguire told the Board. The old data “probably didn’t tell us the whole picture,” said Maguire, who explained that the old numbers were based mostly on traffic planning forecasts and U.S. Census data that are at least five years old. 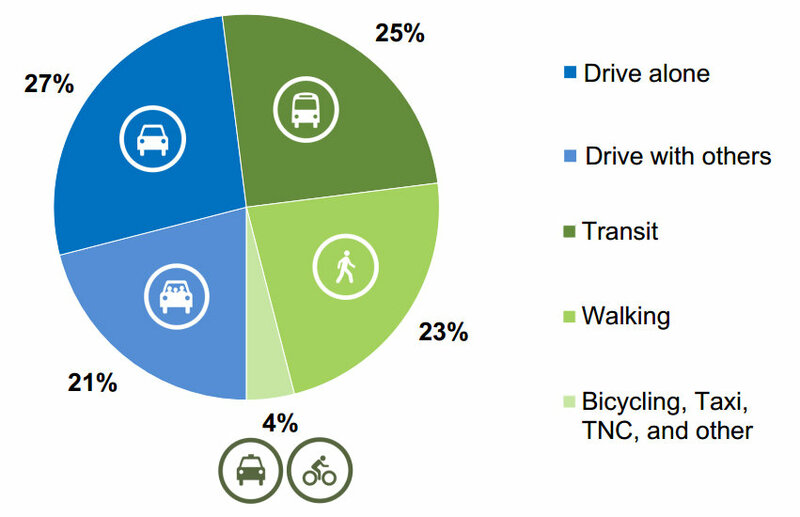 The new data is based on a local, annual “Travel Decision Survey” conducted by the SFMTA which asked residents and commuters detailed questions about their travel behavior. In the three years the new survey has been conducted, the “non-private auto” share of trips has varied only between 50 and 54 percent. Maguire said the consistency of the results is a sign that they’re reliable, while Census data is rougher and subject to a larger margin of error. The new survey results indicate that the SFMTA had already surpassed the goal it set in 2012 to bring the number of private car trips down to 50 percent by 2018. But the numbers also show that travel behavior hasn’t actually changed much in the last few years. 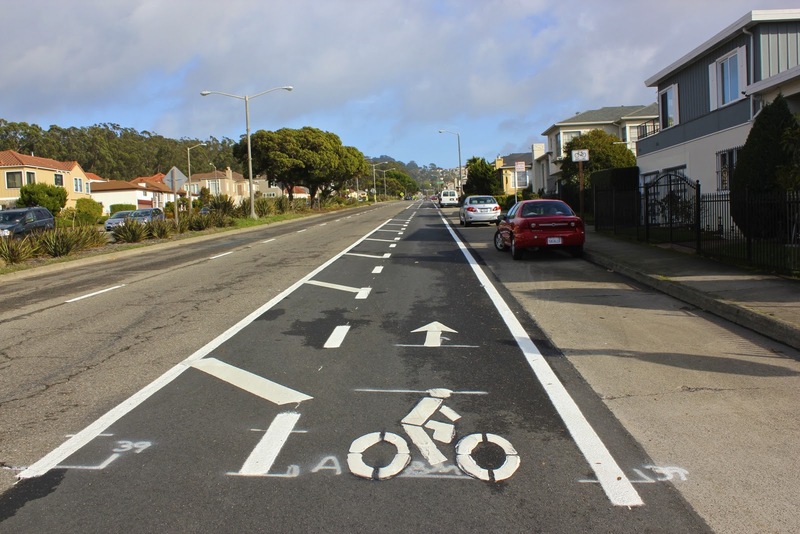 The SFMTA will have to set a new target, now that officials know that the 2018 goal is moot. SFMTA board member Joél Ramos said it’s crucial that the agency set ambitious goals for car-free travel if the city is to avert gridlock as the population grows in the coming decades. “I don’t know how we don’t [move the needle], given all the growth that we anticipate, especially from a perspective of the fact that our streets aren’t gonna get any wider. At least I hope not,” said Ramos. Downtown car traffic during rush hour, he said, is already “a mess” for people using any mode of travel. The new survey data looks rosier if carpool trips — 21 percent of last year’s total — are counted differently. SFMTA board member Malcolm Heinicke pointed out that those trips are counted in the “private auto” section, while trips taken using ride hailing services like Lyft and Uber — basically unlicensed, privately-owned taxis — are not. “I can promise you there are other jurisdictions that would brag about that level of [carpooled] rides,” Heinicke told SFMTA Director Ed Reiskin. Drivers contracted through the ride hailing apps, also known as transportation network companies, “are not already going to the destination whereas with carpool, everyone’s going to that destination,” Heinicke said. Even if driving rates haven’t declined significantly in the past three years, the new data adds to the growing body of evidence that SF isn’t as car-dependent as opponents of reallocating street space to other modes often claim. The SF County Transportation Authority reported in November that car traffic in downtown San Francisco is dropping, and Census data has shown that 88 percent of households added to SF between 2000 and 2012 were car-free. One more interesting detail from the presentation is that the Limited (L) lines will be rebranded to Rapid (R). Interesting report, thanks for posting. A bit funny that biking gets included with other randos such as taxis and scooters simply because the percentages are so low. No mention of the 20% bike modeshare by 2020 goal. Maybe in 2020 they’ll just lump biking+walking together to achieve a % over 20 and claim that’s what they meant all along? Are they actually trying to collect data via anything besides landlines now? Because I always figured cyclists are ridiculously underreported for that reason alone. There wasn’t room for a parking-protected cycletrack here? Really? Or a barrier-separated cycletrack here?! Taking away multiple car travel lanes and car parking lanes all for…a Class II (aka Second-Class) conventional bike lane? You’re doing road diets wrong if that’s all you can get out of removing *four* car lanes. Oh, so we’re playing the hill card? 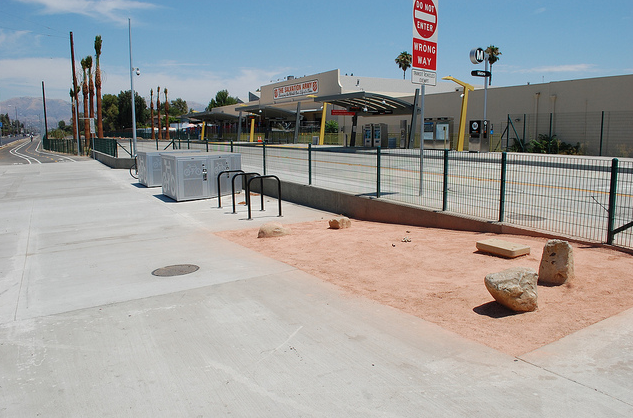 BRT station in LA with adjacent bikeway and bike parking. Let’s aim a bit higher, SF. While I think that it has been long overdue for Muni to have new stop signage (Muni has three types of bus stop signage: one with a physical signs like pretty much everywhere else, yellow band on poles, and just yellow paint on the pavement. ), I think any relabeling of routes to “rapid” is silly. What are the actual significant improvements beyond some cosmetic changes that would warrant this kind of relabeling? Changing route number is kind of like changing telephone area code. Unless there’s a very good reason it shouldn’t be bothered with. No, that still makes them taxis. The idea of shared rides for taxis has been around for a long time (and even advocated by the MTA off and on). The new app-based technology promises to make this easier to make workable (without relying on fixed routes for example). Express is a useful distinction. An Express bus skips a huge number of intermediate stops. A limited bus makes every 5th stop (roughly). 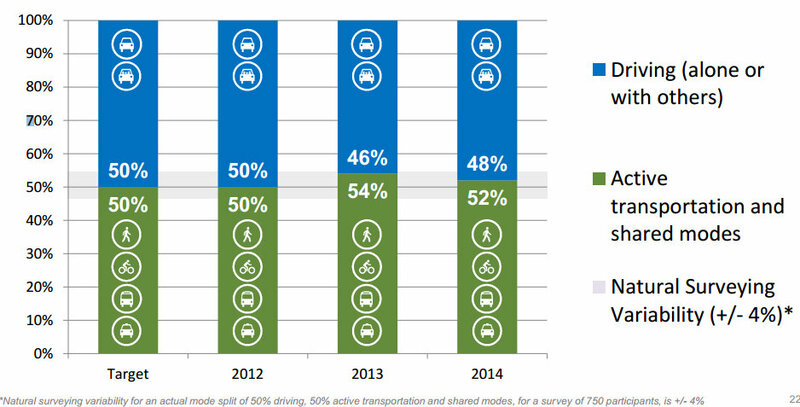 It seems counterintuitive to me that cabs, Uber, Loft, and bicycles only add up to 4% mode share. 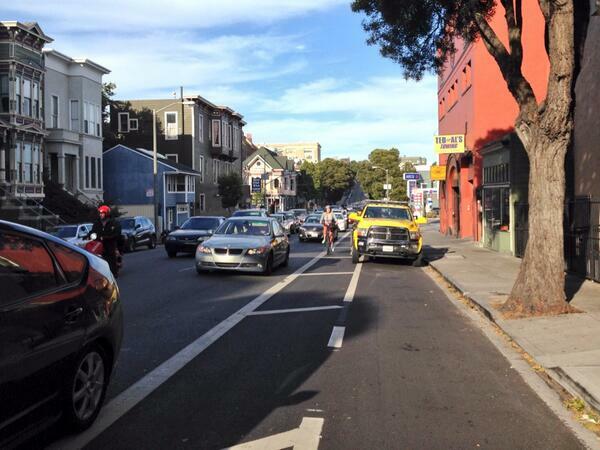 Previous SFMTA reports have put cycling alone at about this level. 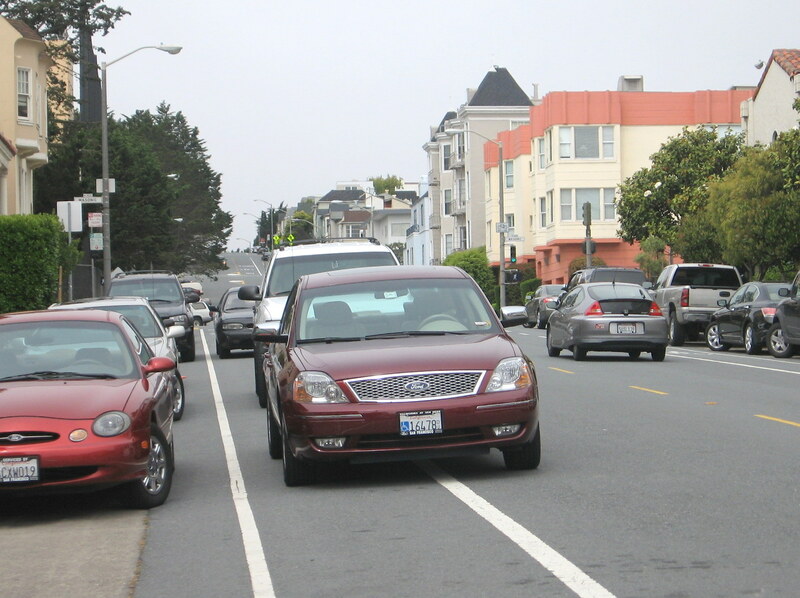 Previous SFMTA reports had put driving at 62%. I think the methodology change that the latest report has employed has accounted better for pedestrian trips. So pedestrian trips were previously undercounted and that has been corrected. That has perhaps squashed the share of all other modes. Great to know that. My main gripe about terming these lines with names that both connote expediency is not really going to be a helpful distinction for average users. I’m a stickler for words. I used to have the opposite problem. I felt that “limited” service had a negative connotation. …which means the convention is off. I only say that with the hypothesis that the laymen–who’s not a transit geek–would understand these terms. They’re meant to be simple and curt, but end of being unhelpful. I don’t see why Taxi and Ride Share count as shared modes. How is one person in a Taxi, Lyft, or Uber any better than a single person in a car. The driver of the car service doesn’t really need to get anywhere, and trips are generated between fares that would not otherwise exist. Really, the only public advantage of these modes is reduced parking. I would really really group Taxi/Ride Share with the blue on the graph. According to data revealed at Velo-city 2013 in Vienna, SFMTA claimed that 3,5% of trips in 2012 were by bicycle, to be tripled to 10% by 2018. Something in the above figures just doesn’t match. For further research, look up “How San Francisco is tripling bicycle mode share in 6 years” in Velo-city 2013 presentations. We’ve been following SF’s mobility strategy here in Lisbon, Portugal, due to some density, geographic and topographical similarities, which affect our mobility systems, thus the interest. Nonetheless what seemed to be a good performer, even by Western EU standards, isn’t so much so. E.g. with this data, for walking and public transport SF is much worse off than Lisbon, and quite a larger share of cars as a percentage of the total. For bicycle mobility at best it’s only 3x better off, with the strategy presented we had estimated it to reach up to 30x higher values. For the most part I wouldn’t recommend copying most of SF’s strategies, as SF is far too cautious in rolling out infrastructure improvements. Planned improvements are often un-democratically “watered down” when a vocal minority complains because they’re afraid of change. And the mostly milquetoast city leadership capitulates. It’s really holding back growth of non-car trips in the city. …but if you look at the data the undisputed leader in bike strategies is the Netherlands. 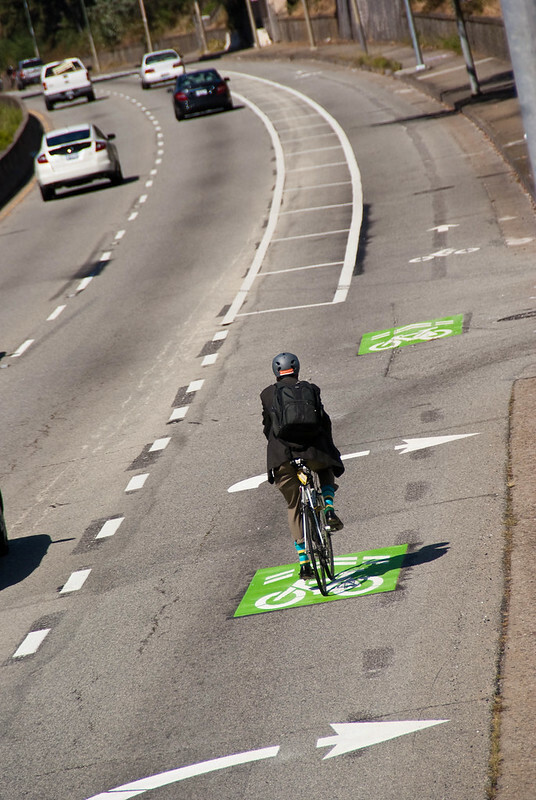 3) In addition, transit + bike strategies can help people with the uphill part of their trip. 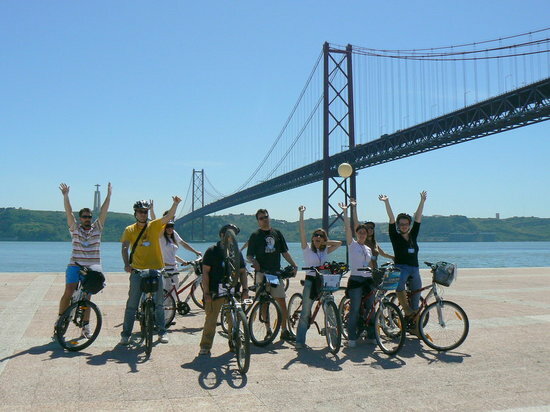 As for point #1, you don’t need, say, 20% bike modeshare in Monsanto Forest Park in Lisbon to achieve 20% bike modeshare in Lisbon as a whole. Just as SF doesn’t need 20% modeshare in Twin Peaks to achieve 20% citywide. How is one person in a Taxi, Lyft, or Uber any better than a single person in a car. You answered your own question – “the only public advantage of these modes is reduced parking”. That’s a huge advantage. Get rid of a 100 car parking lot and we can have a public park with rain permeability, or housing for 100’s of people. I’m really struggling with how to interpret this. I can’t find the details, but It appears to be self reported, so what kind of skew does that put on the data, and has it been accounted for? Does “driving with others” include taking your kids? That seems very different from car pooling to work. If it’s really “trips” does that mean walking to the store on the corner counts the same as a drive, ride or transit trip across the city? That seems strange. But then again the choice to walk 3 blocks versus driving a mile is important because it indicates a desire and ability to do things more locally. Maybe the right number should be time spent doing each (walking, cycling, driving, riding transit). 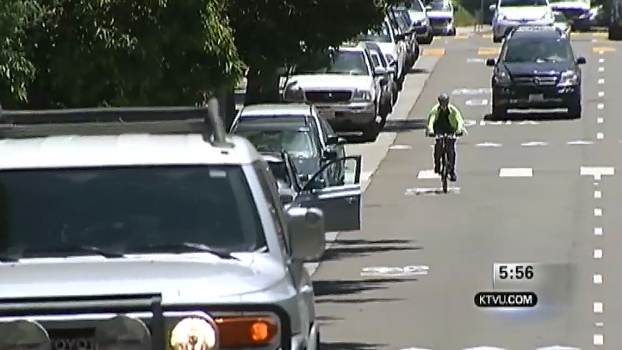 That might tell us more how our streets are being utilized and help us make better tradeoffs. I think the commute mode share is a bit more informative. It more normalizes time, as many studies have shown that people fall into time buckets. Most want to be within 30 minutes of work, by whatever mechanism they choose. It also measures usage at maximum, when tradeoffs are most necessary. And Aaron couldn’t let an otherwise pretty even handed report go by without quoting another sorta accurate but meaningless number. ” 88 percent of households added to SF between 2000 and 2012 were car-free.” That is not what has been shown by that report. All it said was that 88% of the net growth in households was accounted for by growth in households that didn’t have a car. It’s not surprising when we are adding parking at a lower rate than households, while removing automobile travel lanes. Especially when most of the added households were in already dense areas. Nothing generates more trips than car ownership. We only have one car. If the car is gone (or spoken for), and I want a burrito – I either make one, or walk/bike. Maybe the right number should be time spent doing each (walking, cycling, driving, riding transit). On the one hand, that’s unfair because in the densest parts of SF, the same cycling trip takes less time than driving to that destination. On the other hand, if you add up all those endless rides on the N-Judah and 38, riding transit would win hands down. While the individual trips may often be solo passengers, there’s also much more continuous use from the same vehicle servicing a larger number of people. Yeah, add in then that when you do need to park that one taxi, it’s only one spot vs. parking at both ends of every trip all those solo drivers would require. I’m not sure how many trips a single taxi makes in a day, but if we say 20 solo-passenger trips, that’s 19 car trips with parking required on each side, plus some of those cars don’t have to actually exist. While I do somewhat agree with this, car sharing (ZipCar at the time) was a big factor in dropping the second car from my household, but the bigger factors were not needing it because of a change in job/commute and the added cost of parking. I can also say for certain that the ease of getting an Uber/Lyft compared to a taxi, has entirely taken away from walking/public transit/biking, and definitely generates trips that we would not have otherwise taken due to parking concerns or public transit inconvenience. There are definitely 30 minute walks that I would have taken gladly (one to a favorite Mexican restaurant) because a taxi was a pain to get, now ends up being an Uber/Lyft, because everyone is running late because they know they can just Uber/Lyft there. So basically, I don’t buy that the advantage is really that great. If there’s no parking in the city, where are these ride share cars coming from? Well, they are driving in from San Jose and Walnut Creek. And that’s great for traffic and the environment. I don’t see how it’s “unfair”. If people are willing to spend longer buto drive, isn’t that worth knowing? I’m not saying to allocate space or funds only on this basis, but that at least tells you something about what people’s current preferences and tolerances are, as opposed to this report which doesn’t really to tell you much at all. It seems to be saying that people who live in a dense place walk a fair amount. Is that surprising in any way? If anything I’m surprised the number isn’t more like 90% of trips are by walking. Mine certainly are. Maybe it says more but the SFMTA isn’t sharing any of the raw data as far as I can tell. Is it out there? What constitutes a trip? In fact from the report it says that the average trip by foot is .9 miles. Does this make much sense? The average trip by foot is like 15 minutes long? They must have some minimum distance, but they’re not sharing it. I see this: http://dataportal.mtc.ca.gov/bay-area-travel-survey-bats.aspx but the last report listed is from 2000. It seems like they found a way to say “we hit a goal” by redefining the metric. It’s likely that one of the reasons a cycling trip can be faster is because some bike lanes are under utilized, compared to auto lanes. Also cyclists have the ability to split lanes. And some of those cyclists don’t feel encumbered by red lights. So that means that if you want a burrito and the car is there then you drive to get one, right? I invite you to race me down Valencia or market – places where none of those conditions exist, and upon which you have zero chance. If none of those conditions exist and we both go the speed limit don’t we tie? Except on market where I would have to turn and you wouldn’t. This implies that you would drive to get a burrito if you had a car. Otherwise car trips wouldn’t increase. I guess you meant other people, but not you. Average city block is 1/10 of a mile. In general I wouldn’t walk a mile each way just for a burrito. I would (and do) walk a mile for other things. But I sometimes drive less than that if I have heavy stuff to bring home. So it seems a bit more complicated than simply whether one owns a car or not. My point stands, no matter your desire to distract from it. Your point may be true about the specific street you quote. I can’t really say, since I don’t use it much. But it’s not true about the vast preponderance of streets that I do use. That could be because I just stay away from bike focused streets (and maybe you stay away from motor focused ones). My typical experience with those streets is that at crunch times cars are backed up with a small number of bikes using mostly empty bike lanes. The bikes in those lanes certainly make better time than the cars. That was the situation I was referring to, before you distracted from it by bringing up Valencia and Market which has been turned mostly (and should be turned fully) into transit / cycling. 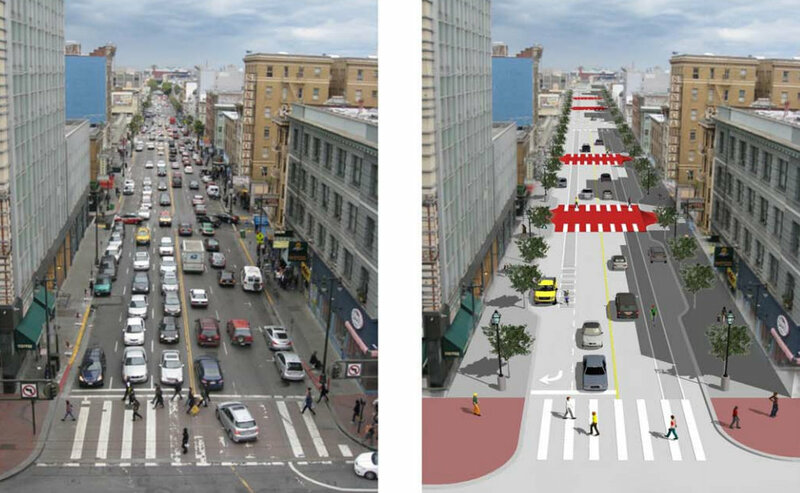 Rebranding the Limited lines to Rapid is another example of the moronic decision-making at SFMTA. Everyone knows what Limited means, but overpaid administrators don’t earn bonuses by not changing things, so we have to spend a fortune changing signs and mounting a major education campaign so people understand that the new name just means the same thing as the old name. Furthermore, riders aren’t stupid and will quickly realize that the newly-dubbed Rapid lines are just as slow, crowded, and unpleasant as the Limited lines (because they are the same routes). Rebranding these lines might make sense if they were radically redrawn and somehow were actually rapid transit, but since they’re not, it’s pointless. I’d far rather see them save the money on the rebranding and apply it to actually improving service. A lot of transit planners with no promotions hanging in the balance would disagree with you. “Limited” has never been a very good brand, since it sounds, well, limited. “Rapid” may be overselling Muni’s product a bit, but the launch of the 5L shows that riders do greatly appreciate these streamlined routes, which very well might live up to the name rapid. Reasonable-minded people can disagree without being “moronic”.